Annual Global Innovation Index has Vietnam in 45th place, up two spots. 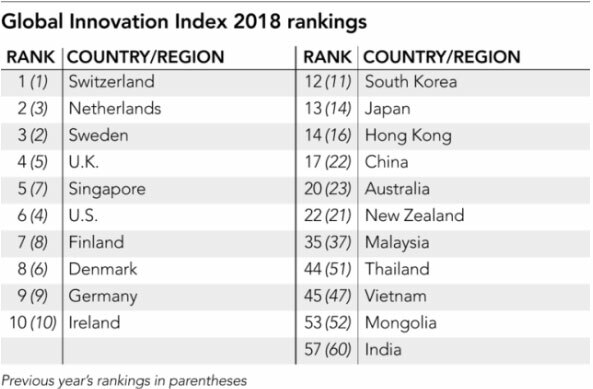 Asian economies are climbing up the ranks of global innovation, with Singapore reaching the Top 5 and China cracking the Top 20 for the first time, while Vietnam ranked 45th in this year’s annual Global Innovation Index (GII) released on July 10. The improvements reflect vigorous government efforts as well as socioeconomic development in the region, according to Nikkei Asia. Calculated from 80 different indicators, the index shows each economy’s ability to innovate new technologies and put them to use. The report was co-published by Cornell University, business school Insead, and the UN’s World Intellectual Property Organization. Switzerland topped the ranking for the eighth consecutive year. Overall, Southeast Asia, East Asia, and the Oceania region showed the most progress compared to other regions, driven by ASEAN, whose countries progressed in innovation and socioeconomic development indicators. Malaysia and Vietnam moved up two positions and Thailand jumped seven to 44th. Among ASEAN countries, Vietnam was first in expenditures on education and trademarks by origin, while Thailand had high tertiary enrollment. Singapore moved up two places from the previous year to fifth. It scored high in indicators such as government effectiveness and FDI outflows. South Korea moved one notch down to 12th, while Japan, Hong Kong, China and Australia all climbed into the Top 20. China, which joined the Top 25 in 2016, rose rapidly, to 17th, indicating improvements in several factors, including high-tech imports and quality of publications. The country was ranked either first or second in terms of research and development expenditures and the number of researchers, patents and publications. The report also addresses “clusters”; areas with particularly intense activity in science and technology. China had the second-largest number of clusters after the US, which had 26. The world’s highest-ranked cluster was Japan’s Tokyo-Yokohama area, with the University of Tokyo and electronics manufacturer Mitsubishi Electric being major contributors. This year’s GII report was themed “Energizing the World with Innovation”, emphasizing the need for innovation in meeting growing energy demand and environmental concerns. According to the report, energy-related patenting has stagnated in recent years since the peak in 2012, declining in the areas of nuclear power and renewable energy technologies. The GII compiles profiles of 126 countries and regions, based on data, composite indicators, and survey questions.